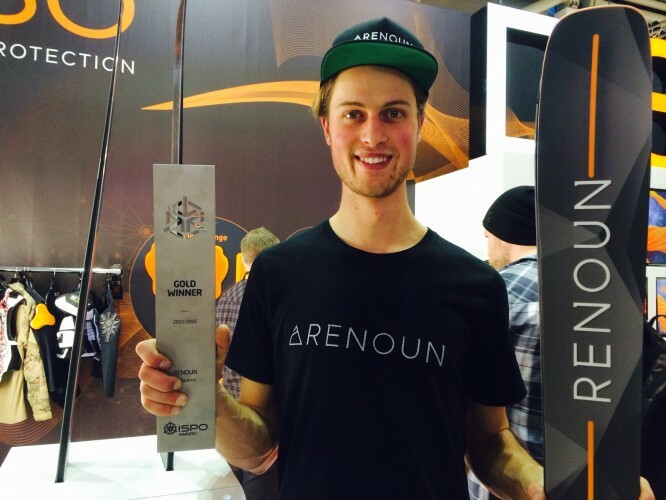 With nearly 80,000 international attendees representing more than 100 countries at the ISPO Munich 2015 event held February 5 through 8, snow sports enthusiasts and businesses were privy to the unveiling of RENOUN ski hardware featuring D30 dampening tech that absorbs high frequency vibrations. The 2,585 exhibiters in a facility covering over 100,000 square feet make it the world’s biggest snow sports trade show. Happy faces all over – ISPO MUNICH 2015 excited everyone from ISPO on Vimeo. The Burlington, Vermont ski manufacturer was granted the ISPO 2015 All-Mountain ski category Gold Award because of superior innovation in design and technology. The high frequency vibration absorption design in the RENOUN Endurance ski is due to D30 tech and translates into additional edge contact with snow and ice equaling better grip and control for skiers, making it the only snow sport product available for purchase that adapts as conditions change. D3O’s technology in also integrated with Rome Snowboards’ boot liner to bring improved cushioning and shock absorption underfoot. Rome’s Katana snowboard binding has smart material from D3O applied to its base plate, giving users increased control and easier ride management. The snow sports space was first disrupted by the British smart materials experts’ impact protection material together with partners Scott Sports and Burton. D30 has since diversified into other body protection apparel for skiing and snowboarding. Their patented technology is derived from non-Newtonian principles, in other words, given standard conditions, molecules in the raw materials flow freely enabling the material to maintain flexibility and softness, however on impact, the particles lock together to absorb impact energy thus reducing force transmitted to skiers. The molecules return to their flexible state instantaneously. D3O material, otherwise known as dilatant fluid, is strain rate sensitive meaning during the largest impacts, more molecules react, causing optimal protection. D3O’s body protection products were first used during the 2006 Winter Olympics in ski race suits for the US and Canadian teams. D3O globally patented impact protection technology is integrated into the snow sports apparel of key global brands including Scott Sports and Burton; the snowboard boots and bindings of Rome Snowboards, and is funded by the US Army to test shock absorbing helmet liner technology to reduce the risk of head injuries caused by Improvised Explosive Devices (IEDs). The company’s branded ingredient technology is found in a wide range of products and applications across six core markets: sports, industrial workwear, law enforcement and military, footwear, electronics and motorcycle protection in apparel. D3O received the Queen’s Award for Enterprise for International Trade in April 2014, the UK’s highest accolade for business, after demonstrating six years’ continuous export growth with sales increasing from 62% in 2007 to 88% in 2013. Sports Techie, When I think of skiing so many thoughts occur. First, the lack of snow or major amounts of snowpack are thanks to global warming. Second, the rapid evolution of the ski and snowboarding industries has caused equipment, training and resorts to morph technologies into their core competencies resulting in faster times and more season ending accidents than ever before. U.S. Olympic champion Bode Miller was seriously injured at the 2015 Ski Worlds in Vail and now talks about leaving the sport for good at 36-years old. Lindsey Vonn returned from a devastating ACL knee injury and failed to defend her championship as expected at the worlds, however, she expects to move forward to compete at the 2018 XXIII Winter Olympic Games in PyeongChang, South Korea. If they used skis, boot and bindings morphed by D3O tech could they both have avoided potentially career ending injuries, it makes you think. If you are an elite, recreational or beginner skier, it makes sense to do whatever you can to perform with the best products and protective gear available on the market to help avoid injury, get a competitive edge and ensure the fun times go on. For the present time, smart material skis are it. If you are in Europe next year, be sure to attend ISPO 2016, it is a business, coach and athlete mecca.